Her name is not Clotilda?! The last week or two has seen an upturn in how squirmy this little girl is. She likes to poke me with pointy parts of her body, like her heels or elbows, too. Good times. It's really fun, though, to lie down and watch her move around in there. It's sort of bizarre, but amazing too. I could lie on the couch for hours and watch her move around in there. It will be strange when she's on the outside and I can't feel her in my tummy anymore. In other news, we went to a baby wearing class last night. It was hosted by a local baby store called Crunchy Granola Baby. The store is really cool and they carry all organic baby clothes, toys, cloth diapers, etc. Definitely a Seattle type store. Anyway, they hold classes every few weeks about various topics that parents are interested in. They host CPR/First Aid courses as well, which is cool. But last night was the baby wearing class, and it was tons of fun. Joshua and I have been talking about the concept of baby wearing for a long time because of the benefits for both the parents and the child. I should probably briefly explain baby wearing for those of you who may be unfamiliar with it. Essentially, it's just what it sounds like. 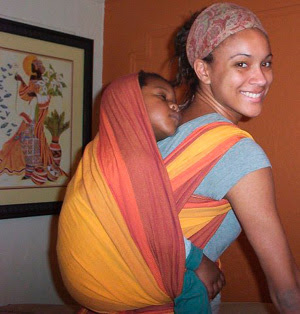 Instead of leaving the baby in a bassinet, stroller, swing, or carseat, one parent "wears" the baby (using a Bjorn, sling, wrap, or other carrier) for the majority of the time. This frees up the parent's hands so that they can get things done, while at the same time helps the baby to bond with the parent and adjust to the world. There are studies that have been done about the benefits of baby wearing, and there's a huge website that is dedicated to the practice. All of this to say, we've been talking and doing research about it and thought that a class about it would be helpful for us. We actually ended up buying a wrap there after the class was over because Joshua is really stoked about it. We both are, but he was the one who picked the color and decided we were taking it home with us. All in all it will be a great adventure and bonding experience for us. Hopefully, we'll get the hang of it quickly, too. About baby wearing -- we didn't call it that back then, but I did the same thing -- I think we called marsupial mothering. I literally didn't have a stroller at all, but used a backpack or just carried the kids in my arms until they could walk. Babies love it because they can be up where the action is and can see everything and be part of things and still be secure. It does seem like strollers are good for carrying stuff, but not usually the baby. The other thing I learned from my work at Head Start was that it's good for babies to have a lot of floor time (on into todderhood too). On a blanket on the floor, not in those bucket seats or walkers or whatever. That way they can learn to move on their own and figure out how to crawl, walk, etc. Obviously, caregiver is right there beside them much of the time, interacting, especially when they're little. Glad things are going well for you. Babies are exciting!